Structure: While Haiku may be written by some in other styles, for THIS meme only 5-7-5 is acceptable. At least one of your haiku must be in this format. 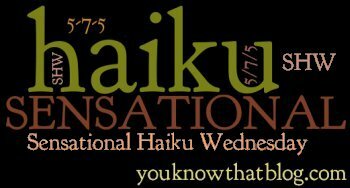 Theme/Prompt: We have a new prompt each week, and your haiku needs to be related to it, if not include the actual word in it. Feel free to leave a word suggestion in a comment! 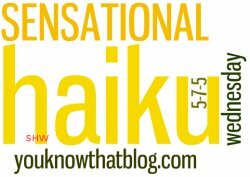 Linking: When you post your link, link to the blog post with your haiku, not to the main page of your blog. Reciprocate: If you participate and post your link on my website, you must have a link back here on your post. It’s only fair. Folks not complying with the above risk having their links removed. Don’t make me be all “Grrrr” and stuff, it makes me grumpy! Thanks for your cooperation! *** Please read the 4 simple guidelines above before you post your link. You can also choose to use only a text link, or either of these additional images I made for your use! Use This one (dark), or This one (light)! ‘Whole-heartedly stuck’ made me smile. Commitment does wonders in a relationship. Enjoyed the haiku and a great message in the last. My first link is not the correct one. Please delete it. Thank you! “Fully committed” is the best way to be! Still some folks using everything except Name/URL in your comment forms. I can’t leave you a comment if you don’t let me :) Know that I tried! it’s easy to commit when you have a committed partner! I really like them all but the first and last one are my favorite. Thank you so much for hosting this wonderful meme, Jenn. I particularly like the second one!